CPS officials are leasing space from DePaul University at 759 W. Belden Avenue to provide a temporary fix for Abraham Lincoln Elementary School's overcrowding problem. LINCOLN PARK — Some students at Abraham Lincoln Elementary will be taking classes inside a nearby building owned by DePaul University next year as part of a temporary solution to solve the school's overcrowding situation. Parents who have been fighting to have a new school built as part of the development at the former Children's Memorial Hospital site are pleased that students will no longer be crammed into makeshift classroom spaces but are angered that Chicago Public Schools has yet to address a long-term solution. 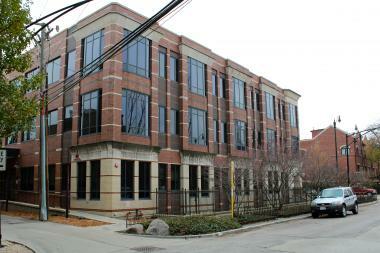 For the 2012-2013 school year, CPS will lease out six classroom spaces in the DePaul University-owned building at 759 W. Belden Ave., about two blocks from Lincoln Elementary, 615 W. Kemper Place. The school asked for nine classrooms to ease the overcrowding. 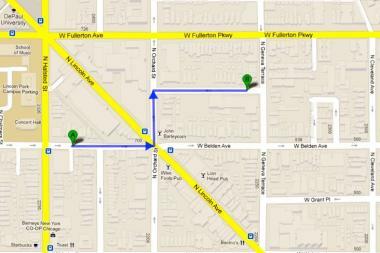 The distance between the Lincoln Elementary's 615 W. Kemper Place building and the proposed space that would be temporarily leased from DePaul University, 759 W. Belden Ave., is about three blocks away. "We are happy that there is finally something, but we are all a little let down that it's a short-term, less than optimal solution at best," said Jerry Quandt, a member of Lincoln's local school council and a parent of a Lincoln student. "In essence, it buys CPS some time for what to do for the long-term solution." While Chicago's focus has been on the underutilization of CPS schools and proposed closings, Lincoln's enrollment is 784 students — well above the ideal enrollment of 630 and higher than the maximum efficiency of 756. Parents at the school fear that enrollment will continue to rise given that there are two major developments planned for within the school's boundaries: a 160-condominium, mixed-residential development at the site of the former Lincoln Park Hospital and the eventual development at the site of the former Children's Memorial Hospital. CPS officials have stated they will not fund the estimated $30-$50 million cost for a new Lincoln school on the Children's Memorial site, but Ald. Michele Smith (43rd) and Lincoln's local school council have been leading a push for the past year to obtain state or federal funding for the project. Some Lincoln parents said the new CPS administration lead by CEO Barbara Byrd-Bennett is already an improvement over previous administrations, as Byrd-Bennett's office has already sat down with Lincoln's principal and spoken with the alderman about the overcrowding.